Concord, North Carolina (June 22, 2017) – Coming off a thrilling career best second-place finish at Elko Speedway, Christian Eckes enters this weekend’s ARCA Racing Series presented by Menards Montgomery Ward 200 at Madison Int’l Speedway with momentum and optimism on his side. 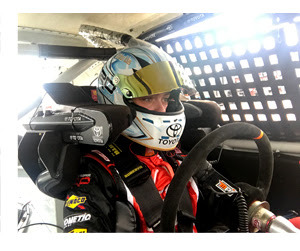 Eckes, at 16-years old and one of the series brightest rookie stars on tour will make his fifth start of the season driving his Venturini Motorsports prepared No.15 New York Bus Sales Toyota. Showing speed and consistency in each of his four season starts, Eckes is second among all drivers in laps led with 225 so far throughout the season – a notable stat considering his part-time driving schedule. Leading laps in each of his races, the Middletown, NY teenager has been knocking on the door for his first series win. Credited with a pair of top-5 and four consecutive top-10 finishes he’s proven to be a legitimate contender. Eckes with eight total ARCA career starts, all with VMS, made four of those starts last season with one coming at Madison’s half-mile short track. Having track familiarity going into the weekend stands out with Eckes. “I’m racing most of these tracks for the first time in my career. It’s not often I get to go back to a track like Madison already knowing what to expect. We had a really good qualifying effort there last year but mechanical issues got the best of us late in the race. It’s a great place – I really like the race track. It really fits my driving style…short, tight, racy…my kind of race track,” added Eckes. The Montgomery Ward 200 is Friday, June 23 and kicks off with practice from 1:30 – 3:00 p.m., followed by General Tire Pole Qualifying at 5 p.m. The 200-lap Montgomery Ward 200 is set for an 8:00 p.m. start and will air live on MAVTV. All times are local (Central). Look for Live Timing, Scoring and Chat at arcaracing.com. Venturini Motorsports (VMS), fielding cars for over 30-years in the ARCA Racing Series presented by Menards, is one of the premier NASCAR driver development programs in the country. Multiple team championships and consistent on-track success, VMS has evolved into one of the most recognizable names in motorsports. Since 2007, VMS has assisted in the career development of notable NASCAR drivers such as Joey Logano, Erik Jones, William Byron, Justin Allgaier, Alex Bowman, Ryan Blaney, Brennan Poole, Daniel Suarez, Kyle Benjamin, and Brandon Jones. Over the years the Venturini name has become synonymous with modern-day racing in America. In 2012, the Venturini family was inducted into the National Italian American Sports Hall of Fame and now find themselves enshrined with such sports icons as Joe DiMaggio, Mario Andretti, Vince Lombardi, Tommy Lasorda and Rocky Marciano.